The fellowship will support Maurel’s work on the magnetic properties of asteroids, and encourages women’s involvement in the field of aerospace. 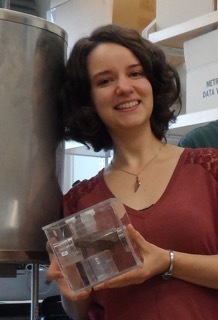 Last week, Clara Maurel, a graduate student in MIT’s Department of Earth, Atmospheric and Planetary Sciences (EAPS) working with the Weiss group, was awarded a 2018 Amelia Earhart Fellowship. The $10,000 fellowship, granted by Zonta International, annually recognizes and empowers thirty women who are pursuing doctoral degrees and excelling in the field of aerospace-related science and engineering. The goal of the fellowship is to help women to have access to resources and representation in decision-making positions. As a planetary scientist, Maurel is studying how asteroids that existed at the birth of the solar system formed metallic cores and generated magnetic fields like the Earth. Since these asteroids were destroyed by billions of years of collisions, and exploring existing metallic cores thousands of kilometers below a planet’s surface is impossible, Maurel uses metallic meteorites, which constitute the most accessible extraterrestrial material, coming from cores of ancient asteroids. She is involved in the NASA discovery mission Psyche, which will reach the largest known metallic asteroid—also named Psyche—in 2026. This asteroid could be the relic core of an ancient asteroid whose rocky mantle was destroyed by impacts: “Visiting Psyche is like visiting the core of the Earth 4.5 billion years ago,” Maurel said in a letter to Zonta International. The Psyche mission will offer a unique window into the violent history of collisions and accretion that created terrestrial planets. As one of the first students affiliated with the mission, Maurel is combining numerical modeling, experiments and engineering to work on two projects related to the mission: studying the magnetic properties of metallic meteorites to put constraints on the signal expected at the asteroid, and modeling high-velocity impacts in metal with the ultimate goal of understanding how craters formed on Psyche and how they may have affected its magnetic signal. Ultimately, she aspires to stay in academia and become a professor in planetary science. Since the program’s inception, Zonta International has awarded 1,573 Amelia Earhart Fellowships. This year, other fellowship recipients from MIT include Nisha Chandramoorthy, Carla Grobler, Akshata Krishnamurthy, and Jacqueline Leah Thomas.